SOCHI, Russia — Russia was embarking on an experiment with weather-altering technology in an attempt to control the snowfall at the country’s first Winter Olympics in 2014, the RIA Novosti news agency reported Friday. Russian President Dmitry Medvedev, center, and Sberbank CEO German Gref, left, inspecting Sochi 2014 Winter Olympics facilities construction in Sochi. The Games will be hosted in 2014 in the Black Sea resort of Sochi and organizers are desperate to avoid the effect of unpredictable weather that played havoc at the Vancouver Olympics last year. Canadian officials were forced to truck in snow after heavy sun left Cypress Mountain practically bare, while at other times events were delayed because of heavy downpours. Russia has used weather-altering practices before, pouring chemicals into clouds from planes to provoke precipitation, but it has never attempted them in the North Caucasus mountain range above Sochi. Meterologists have established monitoring stations across the region to keep track of the vastly fluctuating weather patterns, building a data bank that it hopes will help the organizers eventually conquer nature. “The need to conduct investigations comes from the fact that the ‘weather has never been made’ in mountainous locations,” a statement on the Natural Resources Ministry website explained. VIENNA – The U.N. nuclear [watchdog – the IAEA] said Wednesday it is “increasingly concerned” about a stream of intelligence suggesting that Iran continues to work secretly on developing a nuclear payload for a missile and other components of a nuclear weapons program. The restricted 9-page report was made available Friday to The Associated Press, shortly after being shared internally with the 35 IAEA member nations and the U.N. Security Council. It also said Tehran has fulfilled a [vow it] made earlier this year [to] start installing equipment to enrich uranium at a new location — an underground bunker that is better protected from air attack than its present enrichment facilities. Enrichment can produce both nuclear fuel and [weapons], and Tehran — which says it wants only to produce fuel with the technology — is under four sets of U.N. Security Council sanctions for refusing to freeze enrichment, which it says it needs for fuel only. [Iran] also denies secretly experimenting with a nuclear weapons program and has blocked a four-year attempt by the IAEA to follow up on intelligence that it secretly designed blueprints linked to a nuclear payload on a missile, experimented with exploding a nuclear charge, and conducted work on other components of a weapons program. ….. The phrase “increasingly concerned” has not appeared in previous reports discussing Iran’s alleged nuclear weapons work and reflects the frustration felt by IAEA chief Yukiya Amano over the lack of progress in his investigations. Acquired from “many” member states, the information possessed by the IAEA is “extensive and comprehensive … (and) broadly consistent and credible,” said the report. A Domino's pizza delivery man in Tokyo. 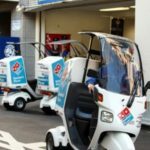 TOKYO — The Japanese arm of Domino’s Pizza was taking public relations to new heights Thursday with plans to build the first pizzeria on the moon, The (London) Daily Telegraph reported. The stunt follows rival chain Pizza Hut’s mission to the International Space Station in 2001, when a pizza was delivered to astronauts orbiting the earth. “We started thinking about this project last year, although we have not yet determined when the restaurant might open,” spokesman Tomohide Matsunaga told the newspaper. Domino’s said the Maeda construction company had begun drawing up plans for a two-story, dome-shaped lunar eatery. It added that the eatery’s staff would live on-site at the 28-yard-wide building. The restaurant chain estimated that the cost of turning the stunt into reality would be about $21.8 billion. Some 15 rockets would be required to deliver 70 tons of construction materials and pizza-making equipment to the moon. “In the future, we anticipate there will be many people living on the moon — astronauts who are working there and, in the future, citizens of the moon,” Matsunaga added. b) What problem did Canadian officials encounter during the 2010 Winter Olympics? c) Do you support the idea of artificially altering the weather? Explain your answer. b) Read the “Background” on Iran and its nuclear program below. Over the past several years, the U.N. has failed to stop the Iranian government from working on the development of nuclear weapons. The whole world has known that Iran is trying to develop nuclear weapons, and that once acquired, the U.S., Israel, Western nations, and the entire region around Iran will be in danger. What do you think the U.S. should do at this point? Explain your answer. Ask a parent the same question. b) What is the estimated cost of opening a Domino’s on the moon? c) Why does Domino’s think a store on the moon will be a success? d) Visit the Domino’s website link under “Resources” below. Do you think a Domino’s on the moon is a good idea? Explain your answer. NOTE: “Answers by Email” has resumed. If you do not receive answers Tuesday morning (Sept. 6th), please contact us. Sign-up for Answers emails below. The United States began weather control research in 1946. Currently, some states use cloud-seeding programs in an attempt to increase precipitation levels or prevent crop-damaging hail. An eight-year experiment in Texas and Oklahoma, conducted over 5,000 square miles, showed that cloud seeding increased rainfall, cloud height, length of storms and the area in which rain fell. Even so, enthusiasm for cloud seeding in the U.S. has dried up since the early 1970s, when federal funding was about $19 million a year. In 2003, the United States National Academy of Sciences declared that 30 years of studies had not produced “convincing” evidence that weather modification works. On the other hand, the American Meteorological Society claims that some studies on cloud seeding show a 10 percent increase in rain volume. — Confirmation of reports by diplomats to the Associated Press [AP] that Iran has started setting up uranium enriching centrifuges at Fordow, a fortified facility dug into a mountain near the holy city of Qom. Iran intends to use Fordow to triple its 20-percent enrichment of uranium — a concern because that level is easier to turn into weapons grade uranium more quickly than its main stockpile of low enriched uranium at 3.5 percent. — Further accumulation of both low-enriched and higher enriched or 20 percent uranium. The report said Iran had now accumulated more than four tons of low enriched uranium and over 70 kilograms — more than 150 pounds — of higher enriched material. Those two stockpiles give it enough enriched uranium to make up to six nuclear warheads, should it choose to do so. The report praised Iran for its decision earlier this month to allow IAEA Deputy Director General Herman Nackaerts to tour a facility where it is developing more efficient centrifuges, saying Iran “provided extensive information” on its development of such machines. RUSSIA: Read about cloud-seeding at wikipedia.org. JAPAN: Visit Domino’s Japan website for photos/information on it’s plans for a Domino’s on the moon at moon.dominos.jp.